Apostle Dr Stephen Kwame Ntow Amoani, the Chairman of Christ Apostolic Church International (CACI), has exhorted Christians to demonstrate Christ-like behaviour in the discharge of their duties to facilitate speedy national progress. He said promoting national advancement was not the sole work of politicians and that Christians and Ghanaians of other faiths have a great responsibility towards the attainment of this goal. Apostle Dr Amoani reminded the public that in all their endeavours- socially, economically and politically, they should always place the nation’s interest first. Apostle Dr Amoani gave the advice at the CACI’s Mega Float and Health Walk which formed part of the Church’s centenary anniversary celebrations. The Mega Float and Health Walk, which brought together more than 1000 members of the church, was to drum home the importance of regular exercise, evangelise to the public and to celebrate the goodness of the Lord. 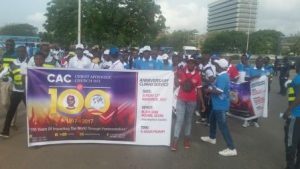 The 10-Kilometre walk started from the Independence Square through some principal streets to Kwame Nkrumah Circle, Danquah Circle, Oxford Street, Osu and ended at the start point, amidst brass band music. The centenary celebration, held under the theme: “100 Years of Impacting the World through Pentecostalism,” had a year-long programme of activities to be organised throughout the local assemblies of the church which was climaxed in November. He urged Ghanaians to bury all ethnic, religious and political differences and come together as one people and contribute meaningfully towards the progress and development of the country. “With a united front, I believe as country we can move forward and we will have a lot of development in our country, but if we are divided I do not think we can move forward as a nation. “Every Ghanaian should know that no one will come out from any country to help us build the nation, we are the very people that can help to develop our country, unity we can make it but if we are divided we cannot make it as a country”, he said. He said unhealthy partisanship, religious and ethnic intolerance were an affront to effective nation building. He, therefore, called on the youth to shun any activities which could distract the peace the country is enjoying. Apostolic Church and Church of Pentecost. The population of the Church, according to 2015 statistics, stands at 1,456 million.